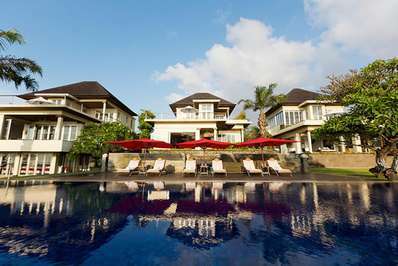 Majapahit Beach Villas, of which villa Raj is a part, are located at Pabean Beach down a narrow lane off the Klungkung Bypass, which runs along the east coast and is also known as the Sunrise Road. 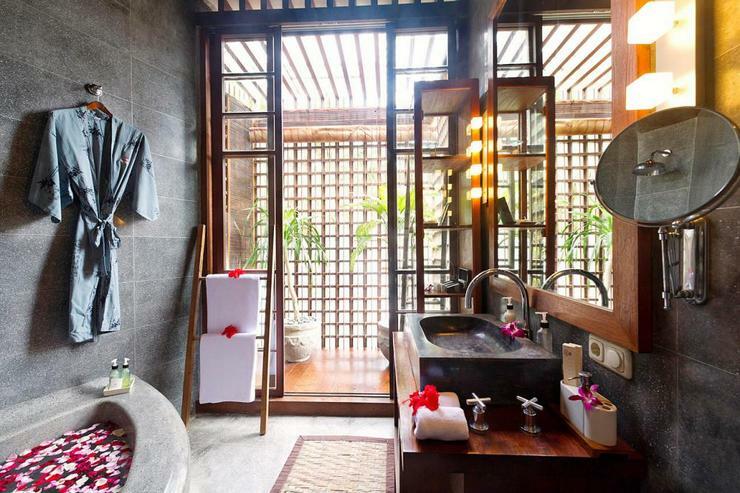 The property is surrounded by the River Wos, rice fields, tobacco plantations, papaya, banana, and coconut groves. 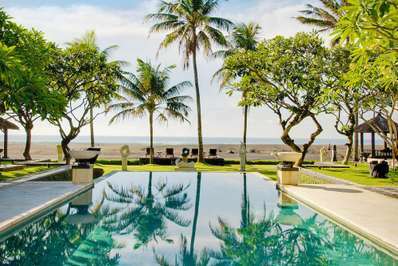 From the villas you can take in the spectacular views extending across the ocean towards the beaches of Sanur and Nusa Dua, the islands of Lembongan, Ceningan and Penida, and the mountains of East Bali. 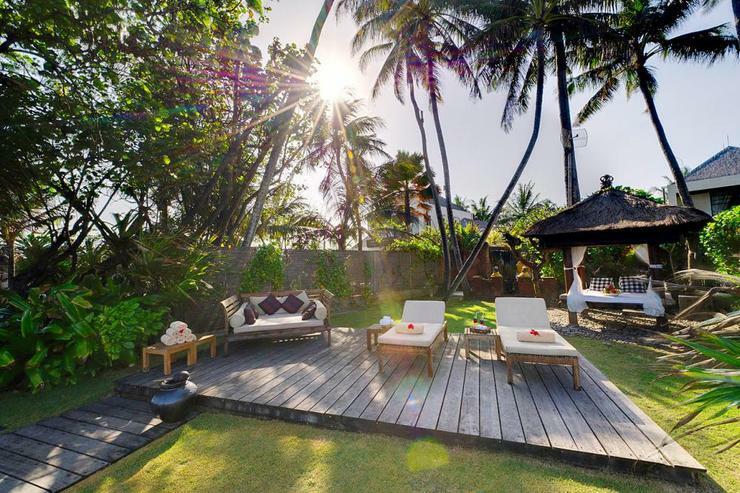 Majapahit Beach Villas is an exclusive complex of four absolutely beach front villas situated on a glistening black sand beach, just 10 minutes north of Sanur on Bali 's south-east coast. One of these villas is Raj villa. 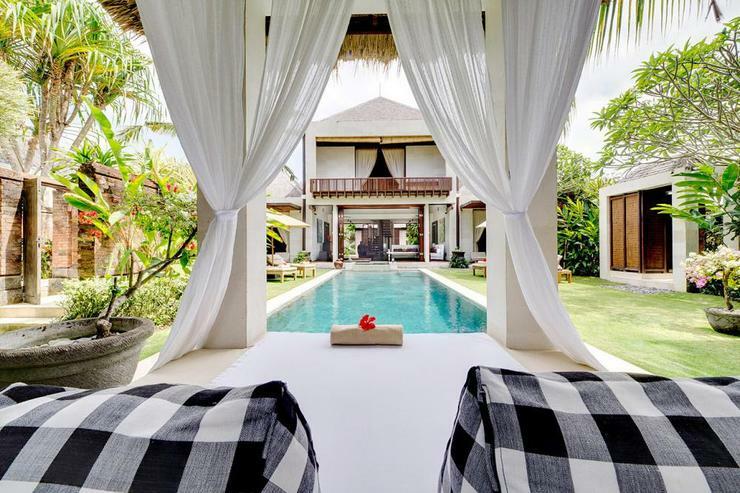 The residence is slightly set back from the beach; however from the upper floor of the villa guests can enjoy spectacular views of the ocean. 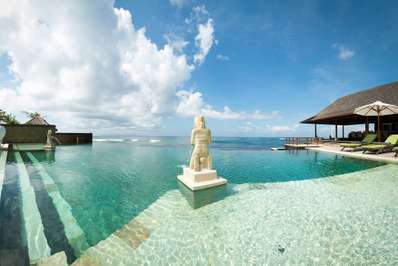 A 13-metre area of beachfront has been specially allocated for the use of guests at Raj and her sister villa, Nataraja. The holiday home is serviced by an attentive yet unobtrusive staff including an excellent chef and personal butler. 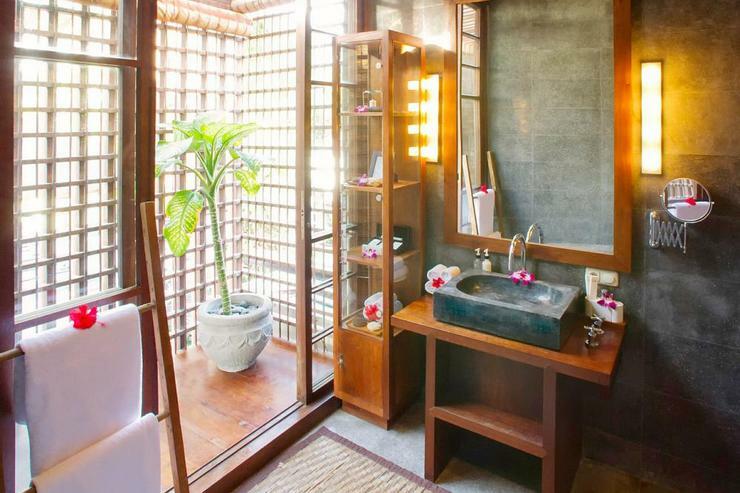 Villa Raj comprises a two-storey main building, housing three bedrooms and a central living area, overlooking a lush walled garden with a swimming pool, massage pavilion and relaxation bale. 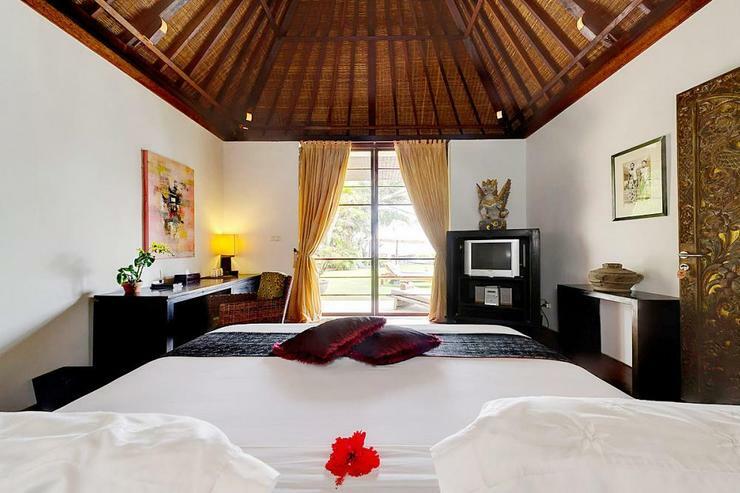 The air-conditioned master bedroom covers the whole of the upper floor and is furnished with a king-size bed, desk and chair, and equipped with a satellite-channel TV, DVD/CD player. 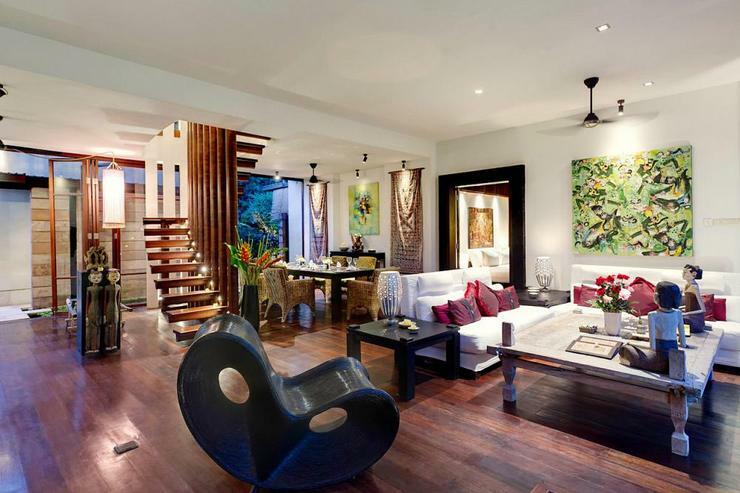 The glass doors open out onto a timber balcony furnished with a sofa and loungers. 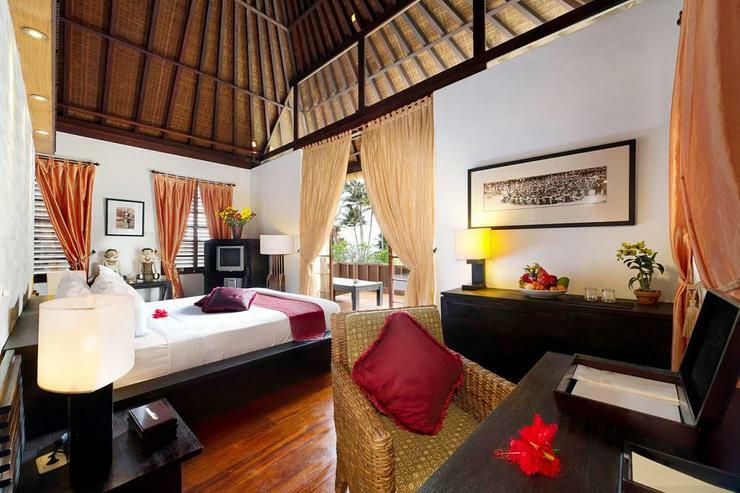 The two air-conditioned guest bedrooms are located downstairs and are mirror images of each other. Accessed via magnificent carved doors, each has a wooden floor and is furnished with a king-size bed, desk and chair and equipped with a satellite-channel TV, DVD and CD player. 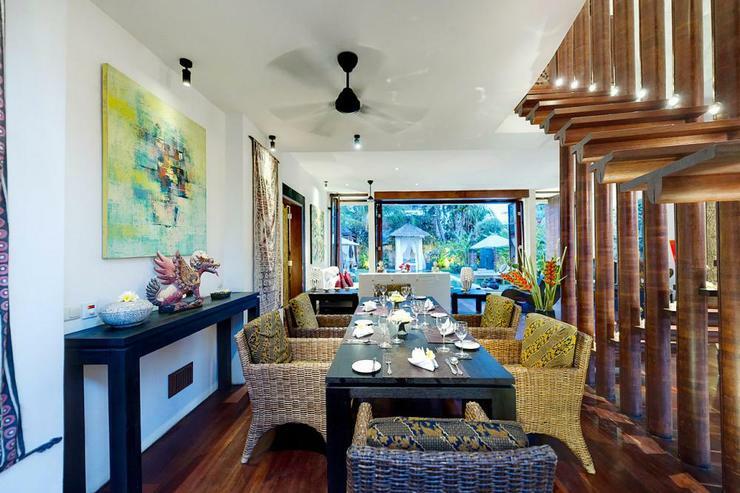 The fan-cooled living and dining room at Villa Raj sits near the swimming pool and features a timber floor and folding glass doors at the front and back which can be fully opened for a tropical living experience. 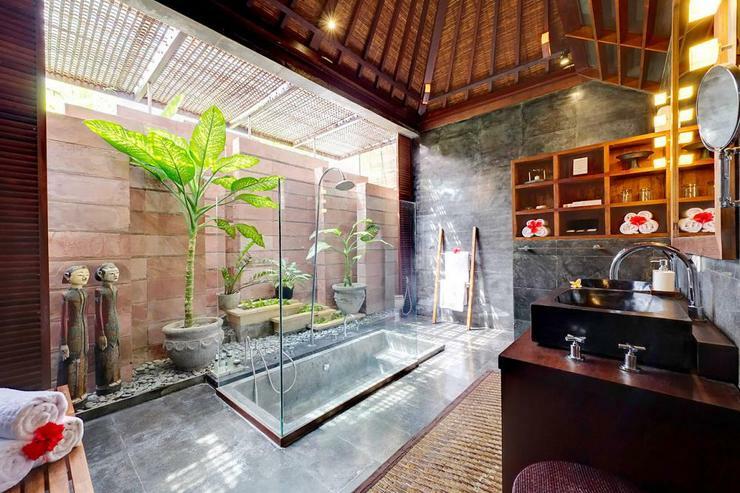 A double sunken jacuzzi extends into the living space and overflows into the pool. The sitting area is furnished with two sofas and has a plasma-screen satellite-channel TV and hi-fi system with wall speakers. WiFi internet access is also available free of charge. 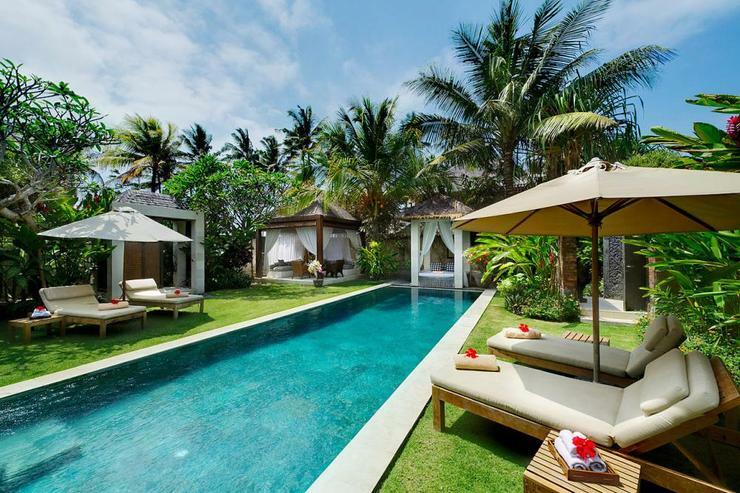 Outdoors, the walled garden is dominated by a 13-metre swimming pool and a bale relaxation pavilion. 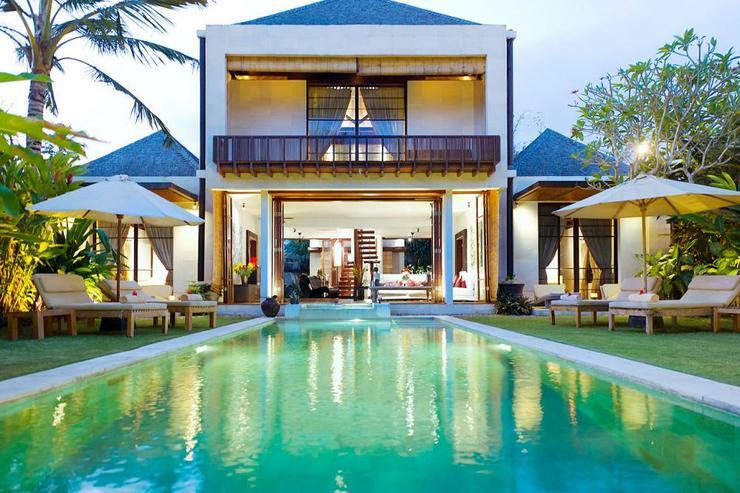 Located in Sanur, Bali. 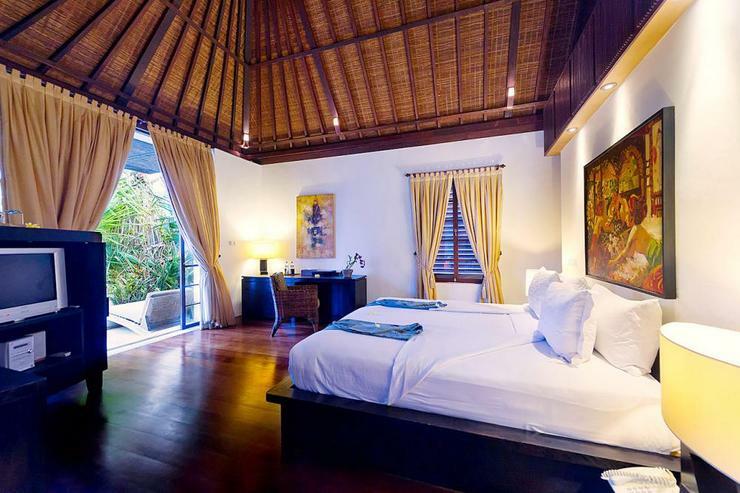 Sanur Residence is a in Indonesia. 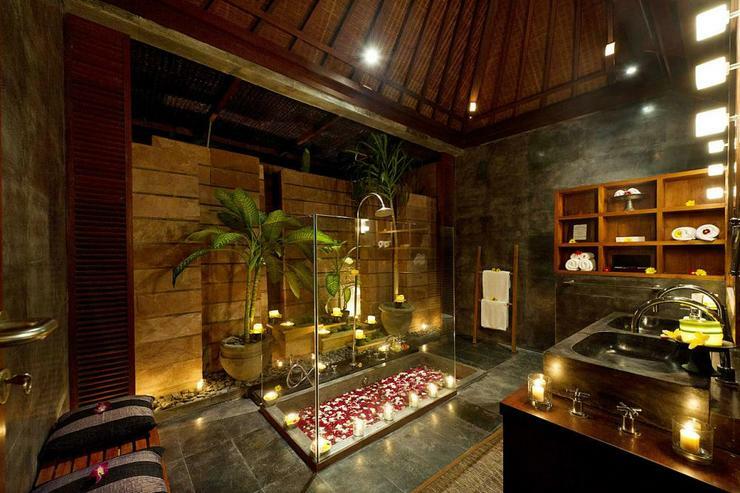 Located in Sanur, Bali. Bayu Gita Beach Front is a in Indonesia. 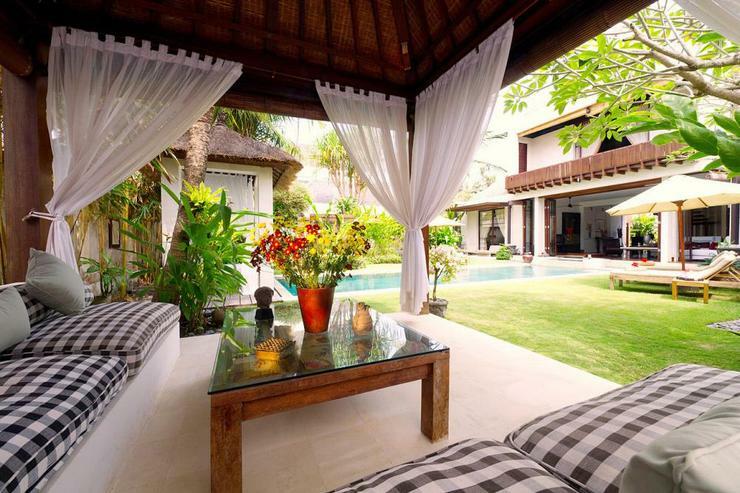 Located in Sanur, Bali. Ylang Ylang is a in Indonesia.